She was given all these names, such as venerable, liberator (Tara), swift one, courageous one (or heroine) and so on, because of all these actions. These are the different names of her different manifestations, the titles she earned because of these works she did during those eons. One of the most important activities in her lifetimes took place in connection with Avalokitesvara. Long ago, a monk called Te man mi gawa which means Faultless Light became Avalokitesvara. From Avalokitesvara’s heart, two different lights shone out. These lights represented yab and yum, male and female. Out of that, from the heart of Avalokitesvara, a helper appeared, and that was Tara. Many accounts of Tara’s origins will tell you that a tear dropped from Avalokitesvara’s eye and that became Tara. Once, Avalokiteshvara became so overwhelmed with helping living beings that he began to shed tears. Then, thinking, “I need help,” he picked up a teardrop and threw it, and, from that, Tara popped up. That is the manifestation. That’s one story and one reason why Tara is known as the feminine aspect of the Buddha of Compassion. Tara had actually been active for many eons before that, but they begin to pick up the story at that level. Somehow they have to pinpoint where she came in first. That’s why some people choose that level, and why some of the Tara biographies, particularly Taranatha’s, begin here. That doesn’t mean Taranatha didn’t know about what happened before that, nor does it mean that Tara herself began at that point in time. One of the most important points at that level of helping other enlightened beings is how Tara protects beings from the eight fears. 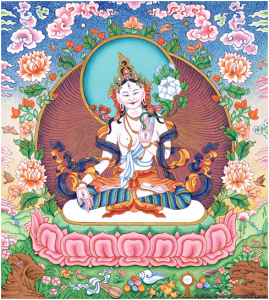 The First Dalai Lama’s Praise to Green Tara talks about the protection from the eight fears. These activities began at that level, at that time.